This week’s brand new Nerdoh T-shirt is inspired by Wayne & Garth’s Rock Festival, Wayne Stock from Wayne’s World 2. 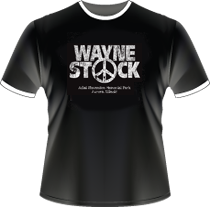 Featuring the festival and where it took place - Adlai Stevenson Memorial Park, Aurora, Illinois - it is printed as a distressed white design on a black retro looking, college style t-shirt with white trim sleeves, giving it a real feel of authenticity. Check it out at our site.